"For a country to develop properly, you must invest in different sectors of its economy to stimulate economic activity. The establishment of enterprises, the creation of new jobs, and the promotion of export are all key to economic development. 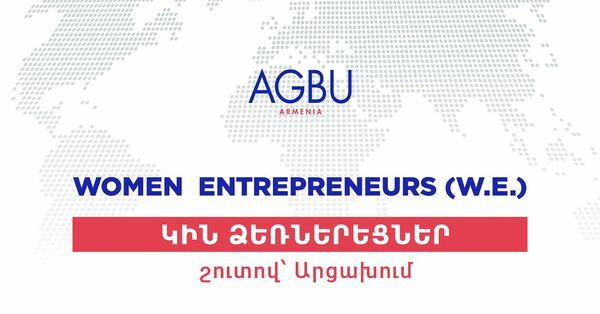 This is why we are joining AGBU in supporting women entrepreneurs in Artsakh by helping them expand their knowledge of finance and entrepreneurship," says Jorge Del Aguila-Eurnekian, Board Member of Fruitful Armenia Foundation and Converse Bank. The Women Entrepreneurs project also offers new opportunities for Armenian women to be more effectively involved in the development of the country’s economy, adds Del Aguila-Eurnekian. Vasken Yacoubian, President of AGBU Armenia and Member of AGBU Central Board, believes that only by strengthening women’s entrepreneurial skills and emphasizing their role in the economy will Armenian society develop and prosper. "Giving women in Armenia an equal share of the economic pie and offering them economic independence will help them improve their decision-making skills," says Vasken Yacoubian. Established in 1906, the Armenian General Benevolent Union (AGBU) is the world's largest non-profit Armenian organization. Headquartered in New York City, AGBU preserves and promotes the Armenian identity and heritage through educational, cultural and humanitarian programs, annually touching the lives of some 500,000 Armenians around the world. For more information about AGBU and its worldwide programs, please visit www.agbu.org . More about AGBU Armenia at www.agbu.am. The Fruitful Armenia Foundation was established in 2001 by Argentine-Armenian philanthropist, entrepreneur Eduardo Eurnekian. The Foundation has supported $8 million dollars’ worth of economic, health, educational and infrastructural development projects in Armenia and Artsakh. The Foundation’s "Nur" project donated more than 10,500 computers to schoolchildren in Artsakh and trained teachers and students in the most recent education best practices.